So for the last few weeks I’ve been settling into the routine of perioperative care. Each day’s pretty much the same – Hit the wards at 8am, attempt to keep up with what’s going on as the consultant sees 30 patients in as many minutes and then spend the rest of the morning begging tasks from over-burdened Junior Doctors. 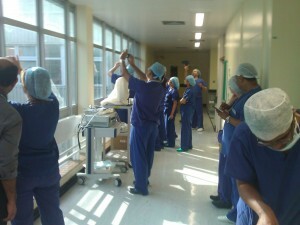 The afternoon are usually spent in theatre – with a choice of engagement which ranges from being “scrubbed in”, which means you get all down and gory with the operation in question, or “stand at a polite distant from the sterile bits and try not to get in the way”, which is basically how it sounds. It’s a far cry from sitting in lecture theatres all day – my feet, unused to the hard world of non-converse shoes, have had to quickly adapt to standing up from 12 hours a day – but I have to say it is far more fun. From sticking patients full of holes with badly placed canullas (I’ll get one in eventually) to taking history after history in the emergency admissions unit there’s never really a dull moment. And if there is, the beauty of being a student kicks in – you can just move to somewhere a bit more exciting! The only downside to all this is that there’s very little time to actually consolidate what you’ve been doing all day. Once you’re home, fed and watered the main biological imperative to sleep kicks in and you end up being exceedinly unproductive. The days, as mentioned, hold very little time for sitting and thinking – actually, very little time for lunch usually. The only exception to this rule came last Friday, while I was stuck slam bam in the middle of the Leicester Royal Infirmary’s Theatre department, watching some Head & Neck surgery. At this point the rest of the world was out blinding themselves watching for the much vaunted eclipse, and we medical students had a wonderful idea to sneak out of our operation to go and stare at the sun for a bit through the theatre courtyard. Being a naive lot we assumed we’d be the only ones there, with the rest of the hospital having better things to do. Then we stumbled upon this. Yup, that’s the assorted surgeons, anaesthetists, ODPs and nurses coming out in force to stare at the eclipse. It was as near as you could get to a festival atmosphere – from anaesthetists fashioning pinhole cameras out of cardboard (they’re reeally into their physics) to people passing around sunglasses in suprisingly unhealthy ways to get a glimpse of the sun. All a little bit exciting. More than anything it was nice to see people taking a moment from the frantic pace of hospital life to appreciate something unique. Of course, the people actually responsible for theatre patients missed the whole thing entirely, but that’s the responsibility that comes with putting people to sleep and probing them with scalpels. That’s about it for now – hope you’ve all been well! 'Ello 'ello! Thanks for scrolling all the way down here. A bit about me: My name's Matt and I'm a 4th-year Med Student at Leicester. I'm a Global Health graduate and spend lots of my time with Medsin-UK, a student network which tackles health inequality through campaigning and advocacy. This year I'll be running a Global Health Short Course with Medsin Leicester (tinyurl.com/uolghsc, open to all), and advertising for participants in PASS1, a UK-wide study into the exposure of Medical Students to Pharmaceutical Industry marketing. If you have any questions about applying for Medicine, surviving Medicine or anything else (pssstt ask about global health), don't hesitate to get in contact.